Grow your own clean, organic produce with the first modular, self-watering vertical gardening system designed for urban spaces. For so many of us, buying fresh, organic produce is not so easy. And even though we’ve all heard about the importance of buying local, organic fruits, veggies, and herbs, the choice is often made more difficult when organic is less affordable and perhaps even unavailable. We need an easy way to bring fresh, clean produce into our homes and communities. What better way then to grow your own—even if you don’t have a yard. All you need is a little vertical space—any wall, fence, or balcony will do—and you can farm fresh, clean produce for yourself and your family. Farm In A Box answers the call for easy access to fresh produce. 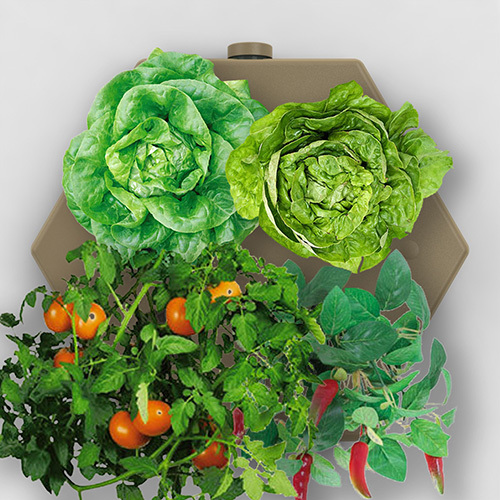 Farm In A Box (FIB) is the first self-watering vertical gardening system. Because of its seamless design and simple usage, FIB makes it easy and affordable to grow your own food. We’ve designed FIB with simplicity in mind, while still adhering to the highest standards of safety, health, and environmental sustainability. Your FIB is reusable season after season and will last you for years to come. 1. Add dirt and insert a starter plant into each opening. 2. Mount one or more units to a wall, fence, or balcony. Indoors or outdoors. 3. Add water to the built-in reservoir, replacing the cap when full. That’s it—you’re farming now! Farm in a Box automatically regulates the flow of water to keep your plants at the perfect level of moisture depending on the sun, temperature, and needs of the plants you are growing. A built-in water level indicator shows you exactly when it’s time to add more water. FIBs are as easy to hang as a picture and it works just as well indoors as it does outdoors. Group together several to convert a fence, balcony, or wall (indoors or outdoors) into a farmable space. 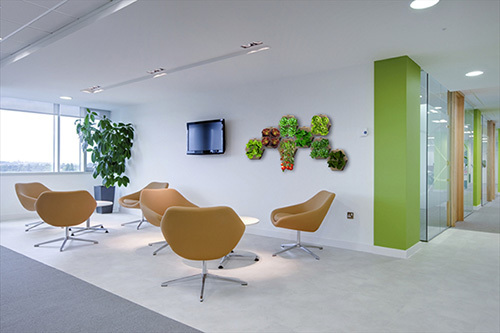 And even though FIBs were designed to grow produce, it is also a beautiful way to transform any vertical surface into a lush indoor or outdoor garden of a plants and flowers. Hi. I’m Doug. I’m a home designer and builder committed to making our lives greener and healthier. I created Farm In A Box especially for urban dwellers who simply do not have access to backyards or community gardens—indeed, the majority of the population. I had seen other vertical gardens before, but so many of them had huge design flaws—they drained water too quickly or held on to water too long, both of which caused plant failure. The real advantage of FIBs is the automatic watering technology—this makes it so easy to succeed as a “farmer” by doing all the watering and fertilizing for you.Beyond that, I wanted to make something versatile, something that would scale easily for a variety of spaces and uses. As a home designer and builder, I always make a point of bringing environmentally safe and biologically healthy design into “healthy housing.” Over the years, I have invented many creative solutions to make home life more “green,” sustainable, and healthy. I’m proud that FIBs offer the most viable solution to the problems of access to fresh, organic foods. I designed FIBs with all ages and gardening abilities in mind. Growing vegetables, herbs, flowers, and plants is a rewarding experience. Whether it’s your first time or your hundredth time growing plants from seedlings, the thrill of eating a home-grown fresh vegetable or gifting a bouquet of home-grown flowers never gets old. FIBs are a great way to teach kids about both the growing cycles of plants as well as the importance of eating clean, organic food….not to mention that it just tastes better! In fact, we think FIBs would be a perfect teaching tool in classrooms and community garden for all these reasons and more. We’re ready for production and really need your support. By supporting or pre-ordering your own Farm In A Box now you’ll help us reach our last crucial milestone: manufacturing. FIBs have evolved over a three-year period. Throughout our research and testing, we’ve perfected FIBSs over 60 different prototypes until we reached our goal of a beautiful, scalable, and easy-to-use vertical gardening system. The final step before we can bring FIBs to the people? Manufacturing. Our goal of $45,000 will pay for the very expensive injection molds for food-grade plastic parts. With these molds, we will be able to produce a first run of 10,000 FIBs. Fall 2014: Contract and build custom injection mold; finalize all tooling, assembly, and packaging. Winter 2014/2015: Shoot test injection mold and make final adjustments to production process. Once everything is perfect, it’s show time! We’ll order an initial run of 10,000 units. Spring 2015: All 10,000 FIB units, plus shipping and packing material, delivered to our Los Angeles, CA headquarters for assembly and packaging. First deliveries of FIBs will ship out in April/May 2015! FIBs are sustainably made from the best recycled materials. No virgin material is used. The shell is made from a blend of bamboo fiber mixed with recycled/repurposed PVC plastic. All packaging and shipping materials are 100% post-consumer recycled cardboard and paper. Our materials meet stringent health standards and are non-toxic. 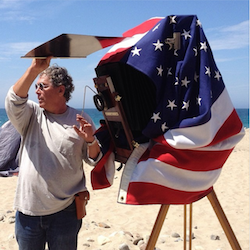 FIBs were designed for assembly and production in the USA by our veterans. We will be using a combination of imported and domestic components to assemble in Los Angeles, California. Technical Specifications Dimensions: 12w x 12h x 3d. Lightweight: Approximately 14 ounces when empty. Mounting: the two mounting screws are provided with each FIB. We’re joining forces with the community. Farm In A Box is partnering with the Social Justice Learning Institute and 100 Seeds of Change to spread awareness about local-level food systems. By supporting Farm In A Box to reach our goal of manufacturing, you are also supporting a community movement driven by a desire to develop a local food economy. The Social Justice Learning Institute (SJLI) is dedicated to improving the education, health, and well being of youth and communities of color by empowering them to enact social change through research, training, and community mobilization. SJLI envisions communities where individuals use their agency to improve each other’s lives. SJLI believes that all communities should have access to fresh whole foods, clean and safe open spaces, and quality medical care. SJLI is committed to addressing health disparities through community development that is not only culturally relevant, but also builds the capacity of individuals to make healthy decisions in their personal lives. SJLI’s flagship health equity initiative is 100 Seeds of Change, which seeks to create a local, sustainably and economically vibrant food system. By activating home plots, schools, parks, and vacant lots with gardens, nutrition classes, cooking demos, and healthy living education, SJLI’s 100 Seeds of Change program empowers community members to eat healthy, thus lowering their risk of diet related diseases. The produce grown on these mini-organic-farms is managed by a local community network, and is distributed at affordable rates. Utilized year round, the produce harvested from these gardens is made available to the larger community through community-supported agriculture (CSA). In partnership with local school districts, SJLI’s 100 Seeds of Change program supports K-12 educational programming, which includes science curriculum and hands-on experience. By participating in school gardens, students gain: applied knowledge of scientific concepts, vocational training in urban agriculture, team building and leadership skills, and a rich understanding of environmental sustainability and nutrition. 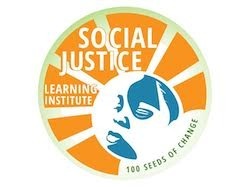 Learn more about the Social Justice Learning Institute and 100 Seeds of Change here. To ensure that we do not encounter any unexpected hurdles when going from prototype to production, the FIB team has tested our design over 60 prototypes. The last pieces to be ordered are the very expensive injection molds for plastic parts. To verify these designs, we’ve had them 3D printed so that the injection molds are as close to our prototypes as possible. Our goal of $45,000 will pay for these plastic molds that will enable us to go into production. © 2014 Farm in a Box. All Rights Reserved.